The Old-Fashioned Blueberry Coffee Cake recipe I made from the Cakes & Ale Bakery (Decatur, GA) feature in Bon Appetit September 2012 was really successful, so I tried another recipe from the feature, Cream Cheese Pound Cake with Citrus Glaze. Chef Wolitzky replaces some of the butter in a typical pound cake with cream cheese, which is supposed to make the cake moist and rich. The recipe gives volume-based quantities for citrus zest and juice. In practical terms for the zest I used one navel orange, one lime, and two small lemons. For the 1/4 cup + 1 Tbsp lemon juice I needed three small lemons. The orange and lime used for zest have sufficient juice that one doesn’t need additional fruit for juicing. The icing was quite thin initially. I had to reapply it several times over before it started to solidify and stay on the cake. The cake had a bright citrus flavor and was not overly sweet. However, in my hands the cake came out slightly dry. 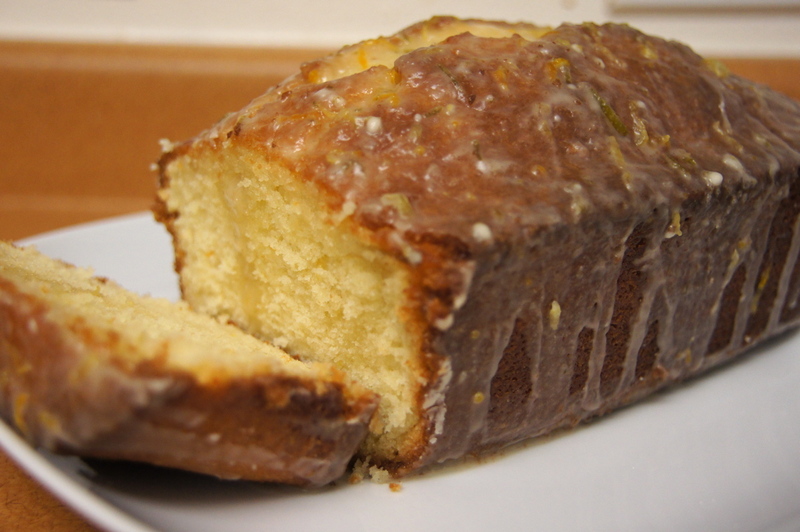 For a lemon cake I prefer Tartine Bakery‘s Almond-Lemon Tea Cake recipe. It is much richer, with a batter made with butter and almond paste and a crunchy crystallized citrus glaze. Difficulty: not very difficult. A stand mixer is helpful. Nutrition: well, aside from the cake flour, sugar, cream cheese, butter, and powdered sugar, there is some healthy citrus. Good for scurvy. Link to Cream Cheese Pound Cake with Citrus Glaze recipe here. Link to Tartine Almond-Lemon Tea Cake recipe here.